If you're like me, you probably prefer to travel light: a backpack or small carry-on bag is usually enough for a quick trip, and it'll save you a trip to the luggage carousel when you deplane (not to mention baggage fees). But if your travel plans keep you away from home for any more than a week at a time, you’ll want to consider bringing a full-sized suitcase, like our favorite, the Travelpro Platinum Magna 2 29" (available at Amazon for $318.94). Larger and more ruggedly designed than their overhead bin-sized counterparts, full-sized suitcases are meant to survive being stashed in an airplane cargo hold. They can contain enough clothes to see you through a multi-week Caribbean cruise, with no visit to the shipboard laundrette required. More importantly for some, the cavernous dimensions of a suitcase or a huge rolling duffel bag are ideal for stashing mementos and duty-free swag from your time abroad. We spent days researching which features a great suitcase should have before calling in eight of the top models on the market for intensive testing. The aim? To see which ones deserve your hard-earned money. Travelpro's Platinum Magna 2 is the best suitcase to invest in right now. It’s made well enough that it’ll survive years of vacations, trips back and forth from university, or extended business travel. The 29-inch design offers 137 liters of packing space, which was more than adequate to house all of the items we packed into it during testing. Measuring 29 x 20.5 x 12.75 inches in size and weighing weighing in at just over 11 pounds, it won't fit into an airplane's overhead bin or slide under a seat. 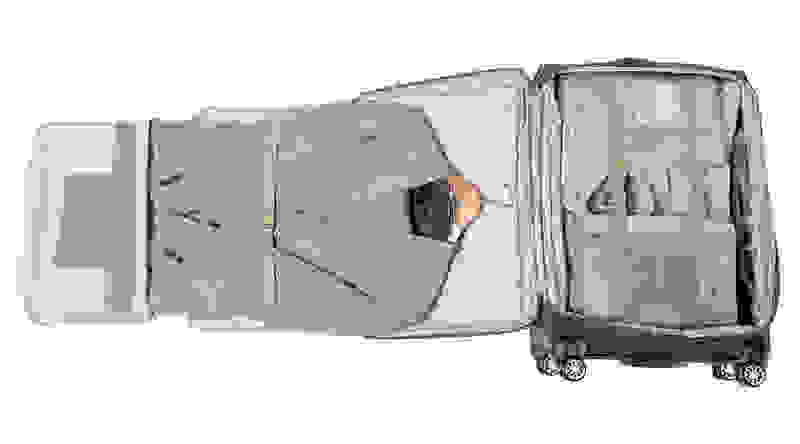 But its rugged Cordura exterior ensures it'll come out of your plane's cargo hold in one piece, no worse for wear. The suitcase’s four spinner wheels are aligned by magnets. This guarantees that all of the wheels move in the same direction at the same time, no matter which way you push or pull the suitcase. Whether you’re wheeling through customs or throwing it in the back of a rental car, this suitcase is easy and pleasurable to steer. On the front of the Travelpro you’ll find an expandable zippered pocket that’s ideal for last-minute items, shoes, or wet towels. Look inside and you’ll find that the cavernous main compartment is flanked by two zippered pockets that run the full length of the suitcase. One is lined with transparent plastic, making it a great choice for toiletries and other liquids. 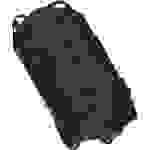 The other is made of breathable mesh, perfect for undergarments, socks, and other small items. Zippered storage panels are also sewn into the main compartment’s compression straps, there's a large mesh pocket inside the lid, and a compression panel helps you stuff in and organize as much clothing as possible for longer trips. Should you need the additional space, the Travelpro is expandable—just be sure to weigh your overstuffed suitcase with a luggage scale before leaving for the airport. 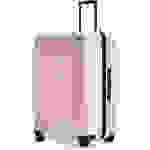 You should know that while this suitcase does come in a couple of different colors, it’s not the most stylish bag. For something a little more fashionable, check out The Large AWAY Travel Suitcase or the Briggs & Riley Large Expandable Spinner. Suitcases with a polycarbonate outer shell don't wear as well as fabric suitcases, but they do a better job of protecting the contents of your suitcase from impact damage or being crushed by heavy objects in an airplane's hold. If you're looking for a new hard-sided suitcase to take on your next adventure, we think that The Large Away Suitcase is a great option. 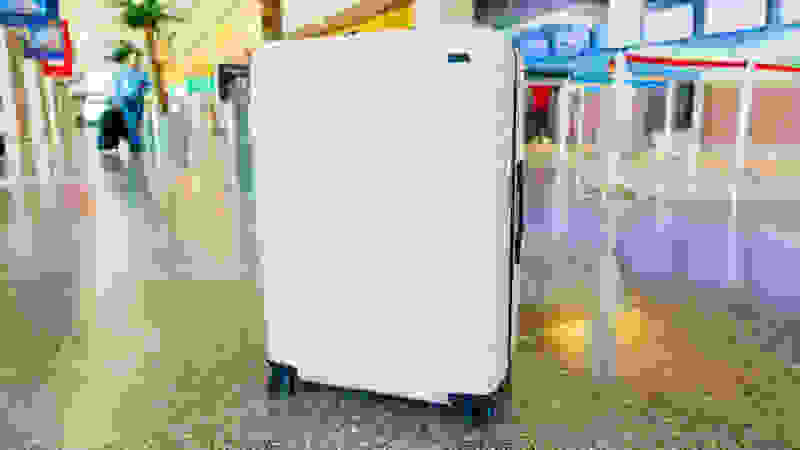 Its tough yet flexible polycarbonate outer shell is available in a wide variety of colors and—with its textured, matte finish—is less susceptible to picking up scuffs and dirt than other hard-sided suitcases that we considered or tested. Measuring 29 x 20.5 x 12.5 inches, The Large suitcase offers just under 100 Liters of packing space—more than enough to hold two weeks' worth of clothing with room left over to haul a ton of souvenirs home. There aren't any pockets on the outside of this suitcase, but the roomy interior features several mesh pockets and a clip-in compression panel that'll help you keep your belongings organized while you're on the road. As your trip wears on, you'll be able to separate your dirty clothes from your clean stuff using the suitcase's included laundry bag. And once everything you want to take with you is safely packed away, you can secure your belongings with the built-in combination lock. Our only real beef with The Large Away Suitcase is that its wheels didn't always track well on rough terrain, but this isn't a serious enough issue to keep us from recommending it. In late 2017, I tested a ton of carry-on luggage. 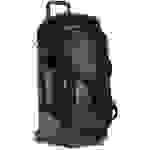 I examined each bag for its build quality, capacity, features, durability, and maneuverability. After talking it over with Reviewed.com’s editorial team, we felt that scaling a number of these tests up for full-size suitcases was a good plan of attack. For example, while I tested carry-ons to see if they could carry a week's worth of clothing, I stuffed all the full-size suitcases with two weeks' worth. The included garments ranged from formal wear for a nice dinner out, to business attire, to a windbreaker and a sweater for chilly evening excursions. A peak inside the Travelpro Platinum Magna 2 29" Expandable Spinner Suiter shows the cavernous main compartment and multiple options for tucking away personal items. I tested each suitcase's maneuverability by wheeling it over a quarter mile of varying surfaces: tile, hardwood, concrete, and cracked sidewalks. For every 20 steps taken with each bag, I performed a 360-degree turn to ensure that its wheels were still spinning freely (and to befuddle curious onlookers). To simulate navigating an airport check-in line, I rolled each suitcase through an obstacle course of tables and chairs. And because a fully loaded suitcase is a lot more difficult to pick up than a typical carry-on bag, I tested how easily each one could be carried up and down a flight of stairs. My name's Seamus Bellamy. I’m a full-time digital nomad, which means I live a lot of my life out of a suitcase. When I'm not busy unpacking from my last trip, I spend my time traveling North and South America in an RV with my wife and our dog, Boudica. I understand what makes a good suitcase a reliable travel companion and what problematic design decisions make a bad one worth avoiding. Price: During testing, we discovered that suitcases are a category where you really do get what you pay for: higher prices meant better quality bags. We're not suggesting that you break the bank to buy a suitcase, but you should consider spending as much as you can comfortably afford. A $300 suitcase might seem expensive for something that you'll only use once or twice a year, but it’s better than forking over $150 for a bag that falls apart after a couple trips. Toughness and Flexibility: Suitcases with a plastic or aluminum exterior can scuff, dent or crack when subjected to abuse. Still, they tend to protect their contents from crush damage better than a fabric-sided suitcase can. Fabric-sided suitcases can compress without sustaining any damage, but they aren't ideal for protecting delicate items. Before you purchase, think about what you're likely to bring with you when you travel. Wheels: If you want your luggage to glide through an airport concourse on wheels, remember that four are better than two. Four-wheeled bags are just as maneuverable whether they're being pushed or pulled. That said, two-wheeled bags are still a good get—they’re more portable than four-wheelers and often cost less. Handles: The best bags have retractable handles that slide smoothly and offer at least a couple of height settings to accommodate shorter or taller users. They'll also come equipped with wide, padded handles that make the bag's weight less of a burden when you have to lift and carry it. The best of the best have handles on multiple sides, making it easy to grab them off of the baggage claim conveyor belt no matter how they're oriented. Organization: Bags that offer an array of interior and exterior pockets along with a single, large interior space are a smart buy. The big main compartment can be used with packing cubes, a garment bag, or packed with loose clothes, while the interior pockets are great for smaller items like toiletries or socks. Outside pockets can be used to stash on-the-go items. Security: Make sure that any suitcase you buy comes with either a built-in TSA-compliant combination or key lock, or is equipped with zippers that can be used with a TSA-compliant aftermarket lock. 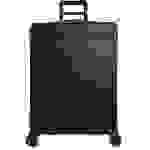 We've never encountered a more robustly constructed suitcase than the Briggs & Riley Large Expandable Spinner. Its heavy-duty Cordura exterior is protected by tons of plastic bumpers and reinforcement points to ensure that it'll last through a lifetime of travel. Sueded leather handles and smooth sliding zippers provide touches of luxury in what's usually a merely functional piece of equipment. We also loved its internal expansion/compression mechanism, since it made it a cinch to size the suitcase to suit our needs. But as luxe as the Briggs & Riley felt, it couldn't match the myriad organization options that Travelpro Platinum Magna 2 provides. Additionally, I kept accidentally retracting the extendable handle while I was wheeling the suitcase around. That button really needs to be repositioned. Not everyone has room in their home for a full-size suitcase. For space-conscious shoppers, a large rolling duffel bag can be a great alternative. The Eagle Creek Cargo Hauler Rolling Duffel is featherweight at just a hair over three pounds, and can be packed down to the size of a couple of boxes of cereal thanks to an included storage case. When deployed for use, the Cargo Hauler has a 90-liter capacity and can be used with either a set of integrated backpack straps or by towing it around on small wheels. When wheeling the bag, you can pull it using one of the backpack straps or a dedicated handle sewn into the lid. The Cargo Hauler is surprisingly nimble given that it lacks a traditional extendable handle, but it's definitely less than ideal if you need to haul it across a large airport terminal or several blocks from a train station. Made from lightweight, water-resistant material, the Timbuk2 Quest should provide users with years of service through hard travel. Like the Eagle Creek Cargo Hauler, the Quest Rolling Duffel can be shuttled around via a pair of padded backpack straps, or on a pair of chunky wheels. I particularly liked how far the wheels on Rolling Duffel stick out, since they made it easy to pull the fully loaded bag up and down flights of stairs. And thanks to its retractable handle, it's much easier to wheel airports or down the road toward a hostel than the Eagle Creek Cargo Hauler. Unfortunately, the handle's inclusion results in other compromises. First, the Timbuk2 can’t be squished down nearly as small as the Eagle Creek when it comes time to put it away—the handle makes sure of that. Second, the handle takes up a lot of the interior space. While its overall dimensions are similar to those of the Eagle Creek Cargo Hauler, the Timbuk2 Rolling Duffel can only store around 60 liters of clothing and sundries. It was able to fit all of the clothing that our tests required—but just barely. This bag is a strange animal. 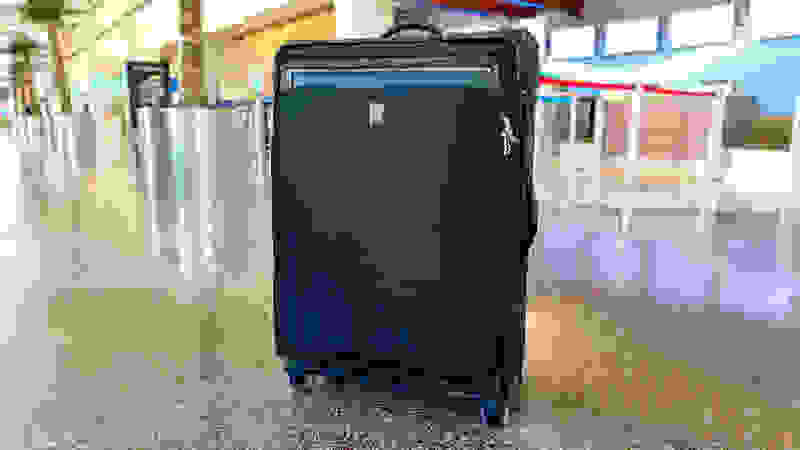 Tipping the scales at just over 10 pounds and boasting close to 90 liters of storage, it mates the hard-sided protection of a polycarbonate suitcase with the exterior pockets common to fabric luggage. Available in three different colors, the Pullman is attractive in a kitschy, vintage way. It's distinct enough from most modern suitcases that you shouldn't have any trouble finding it on a baggage carousel, especially since it comes with a pair of bright fabric flags designed to make it stand out in a crowd. Sadly, in our testing the Pullman failed to live up to L.L. Bean's reputation for innovative design. With only two wheels, it couldn't compete with four-wheeled spinners like the Travelpro when it came to maneuvering through our security line test. The wheels showed surprisingly substantial wear after just a few trips over concrete sidewalks and cracked paving stones. And the insides of the Pullman were something of a disappointment, too. The only built-in organizational aids are a set of retention/compression straps and zippered mesh covers sewn into each side, designed to keep contents from spilling out. This practically forces you to rely on packing cubes to organize your belongings. 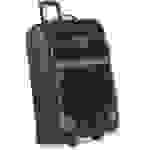 If you need an inexpensive suitcase, you could do worse than the American Tourister Sonic 28" Spinner. But not by much. The sample we received was not well made. Its seams were finished with loose thread, the sides of the suitcase could easily be moved around with minimal force, and the zippers for the main compartment refused to zip or unzip smoothly. I'd feel confident saying that this bag will survive a few flights, but you deserve more than that when you're plunking down nearly a hundred bucks on a suitcase. If you can afford that much, it’s worth spending a little more to get a better product. Where the American Tourister might make it through a couple vacations, our top picks will provide you with years or even decades of service. It didn't take long for us to find fault with this inexpensive polycarbonate suitcase. Right out of the box, we noted that the Desley Areo's shiny plastic exterior was a dust magnet. During wear testing, we discovered that the plastic shell was easily scuffed, making us wonder how many trips this suitcase would survive before needing to be replaced. Additionally, the Desley's spinner wheels refused to line up while we wheeled the case around, making it difficult to steer or to keep it moving in a straight line. You should avoid this one.